ISLAMABAD, Pakistan (CNN) -- Pakistani President Asif Ali Zardari played down cross-border tensions with India in a speech Saturday, telling citizens democracy and dialogue will end discord and increase regional stability. 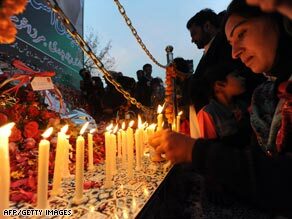 A woman lights a candle Saturday at the site where Benazir Bhutto was killed in Rawalpindi, Pakistan. "The solution to the problem of the region, the solution to the problem of Pakistan ... is politics, is dialogue ... because politics is part of the cure, not part of the problem," Zardari said, speaking at a memorial service for his late wife, former Pakistani Prime Minister Benazir Bhutto. "We have issues? Yes, we have issues. We have non-state actors? Yes, we have non-state actors. Yes, they are posing an agenda on us. We ourselves have accepted we have a cancer. ... We will cure this cancer ourselves." Zardari delivered the national address from Naudero, the Bhutto family home in Pakistan's Sindh province. It comes amid escalated tensions after reports Friday that Pakistan had redeployed military resources on its eastern border with India. Details of those troop movements, however, remained murky on Saturday. CNN National Security Analyst Peter Bergen said a Pakistani official told him that 20,000 soldiers had been moved from the Afghanistan border toward the Indian border. That amount was not significant, he said, as Pakistan has a very large army. "It's a way of signaling the Indians, you know, a unilateral Indian strike into Pakistan is going to be unacceptable to Pakistan," Bergen said. "The reason that's serious, of course, is that Pakistan and India have fought three major wars in the last six decades." India has accused Pakistan of harboring militant organizations after terrorist attacks last month in Mumbai, India, and has said the 10 Mumbai attackers trained at a terrorist camp in the Pakistani-controlled part of Kashmir. Militants launched a coordinated strike against luxury hotels, a Jewish center and other targets in Mumbai beginning November 26, killing 160 people. In his remarks Saturday, Zardari said his government -- which critics claim is unstable and unproven -- will complete its five-year term and follow it with democratic elections. Indian Army spokesman Veerendar Singh told CNN on Saturday that there was no troop mobilization on the Indian side of the border. "We are keeping a close watch over the situation," he said. Singh said that no communication had been received from Pakistan about troop movements but added that the Indian army is always on alert. Asked about the troop movement Friday, Husain Haqqani, Pakistani ambassador to the United States, said, "Pakistan does not seek war, but we need to be vigilant against threats of war emanating from the other side of our eastern border. Since the division of the subcontinent in 1947, India and Pakistan have fought three wars, including two over the disputed territory of Kashmir, which is now wracked by an 18-year separatist campaign that authorities say has left at least 43,000 dead. There also was a limited border conflict in 1999 between the countries in Kashmir. CNN's Bharati Naik and Zein Basravi contributed to this report.